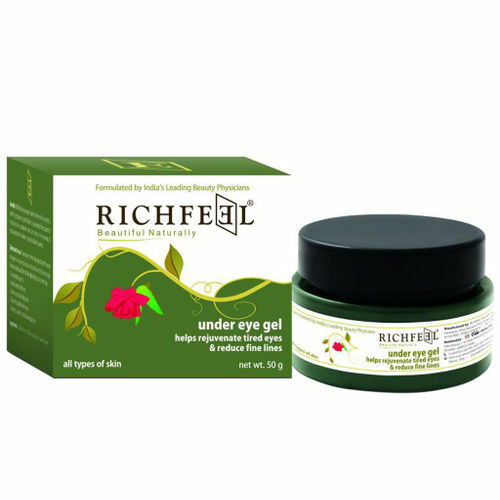 Richfeel Under Eye Gel is a unique revitalizing formulation with cooling effect for helping reducing stress from the delicate skin around the eyes. This gel nourishes the skin & makes it soft & smooth it helps to reduce the fine lines around the eyes. Apply around the eye area, massage gently & keep it on. For best results apply every night along with Richfeel Night cream. Ingredients Purified Water, Polysorbate 20, Isopropyl Alcohol, Olive Oil Peg-7 esters, Advanced Moisture Complex, Carbomer, & Preservatives. Special Features • A unique revitalizing formulation with cooling effect • Helps reduce stress from the delicate skin around the eyes. • Nourishes the skin & makes it soft & smoot • Helps to reduce the fine lines around the eyes.